A versatile duo based in Westchester County, N.Y., All Lit Up consists of Andy Karp on vocals and guitars and Debbie Cohen on vocals, bass and guitar. We perform an entertaining mix of music of blues, R&B, country and pop standards from the 1920s to today. Our songs, ranging from smooth swing to roadhouse blues and country, feature soulful vocals, ear catching harmonies and hot instrumentals. We have entertained audiences throughout the New York metro area at corporate events, private parties, restaurants and clubs. Additionally, we have developed specialized music programs for libraries, schools and other service oriented facilities. The library program combines entertainment with education and has been very well received. We also lead music workshops for schools and other service oriented facilities. Our repertoire can be shifted for the age group and needs of the program. Seniors are as delighted as youngsters. 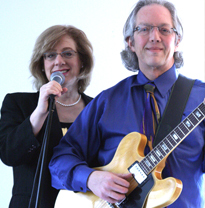 We are available for bookings throughout the New York tri-state area. Let us add fun and excitement to your next event or program. © 2009 Igniting Music. All rights reserved.